Few companies embody the pride of a country more than the national airline. It takes its country’s name and literally flies its colors. Airlines maintain a direct link to foreign economies and are a leading mechanism for trade and commerce. The African aviation industry, however, lags behind the rest of the world, accounting for just 2.85 percent of passengers globally. 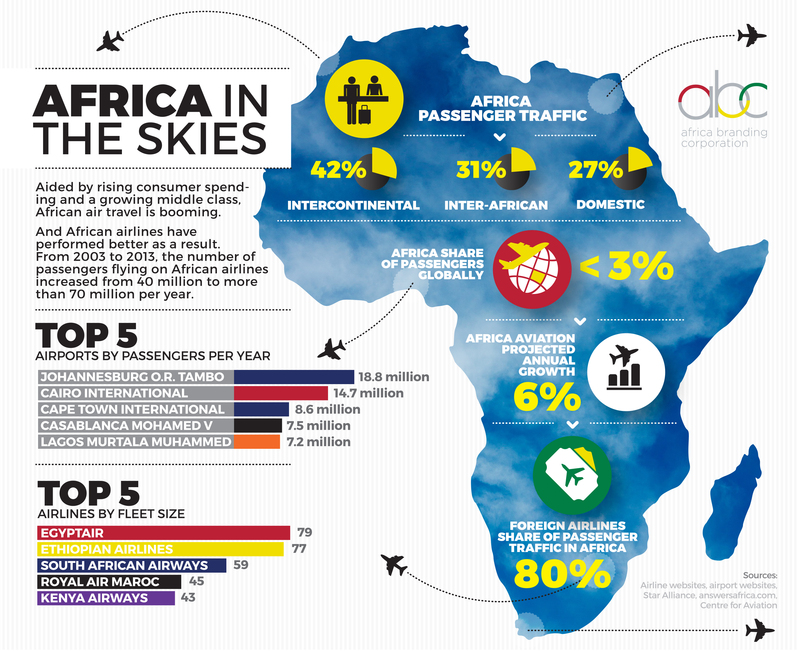 Intra-African travel makes up just 31 percent of total passenger traffic on the continent. Still, the number of passengers flying in Africa has been steadily rising in the past 10 years, buoyed by sustained economic growth and rising middle class demand for air travel. Asoko Insight, Africa’s reference provider of corporate data, has identified five airlines vying for market shares of domestic, regional and international connections. South African Airways, the incumbent Sub-Saharan leader carrying 7.1 million passengers in 2014, now faces stiff competition from Ethiopian Airlines for the top spot. The stock of Kenya Airways has jumped 41 percent since reaching an all-time low last November. Increasing demand for low-cost travel has led to strong growth in the budget carrier segment, with players like Fastjet, Fly540 and Jambojet all seeking new domestic and regional routes. Using market data from Asoko Insight, we study five airlines that are driving growth in the continental aviation sector. In the span of three years, Ethiopian’s revenues shot up 129 percent, to $1.89 billion in 2013. Today, it is Sub-Saharan Africa’s largest airline in terms of fleet size (77) and it flies to 101 passenger destinations. It recently became the first African airline to acquire a Boeing 787 full-flight simulator. Already serving multiple routes to China, it is furthering its role as Africa-Asia champion by adding Tokyo to its routes in March and Manila in June. A member of Star Alliance, Ethiopian has expanded its codeshare with Air India, giving passengers traveling between India and Africa more connectivity options. Once the continent’s pre-eminent airline, South African Airways has succumbed to heavy competition from rivals. The company has been highly unprofitable in recent years, struggling to secure government approvals for a meaningful restructuring. At the end of March, it will be cutting its Beijing and Mumbai routes, but it will be introducing flights to Abu Dhabi as part of an expanded partnership with the Emirates’ Etihad Airways. Despite the loss of the Beijing route, South African Airways has maintained a strong hold on its China market share, signing an extended partnership with Air China last December that will connect multiple cities starting in May. “The Pride of Africa” has struggled to stay profitable in recent years, but the sales of Kenya’s flag carrier have been steadily growing. The airline has been well implicated in the non-stop service race to Asia. In March, it will become the first airline to link Vietnam directly to Africa with a route to Hanoi. Its Boeing 787-8 Dreamliner operations to Mumbai will expand to 11 weekly flights in August. Kenya Airways is also stepping up its intra-Africa game, starting a Boeing 787 service to Luanda, Angola in October and increasing the frequency of its Nairobi-Khartoum route. As the giants duke it out for Africa-Asia supremacy, low-cost intra-continental airlines like Fastjet, based in Dar Es Salaam, are claiming their space in the skies. Established in 2011 following the buyout of Fly540, Fastjet now serves eight routes with a fleet of four aircraft. Last April it completed a $25 million open offer on the London Stock Exchange AIM, preparing the airline for a round of investments. In March it is creating a new domestic route with four weekly flights between Kilimanjaro and Mwanza. And it is already expanding beyond Tanzania. Its Zambia subsidiary just received a critical Phase 1 application approval for an air operating certificate. Similar expansions to Ghana and Angola will be underway once the company resolves a public dispute with Fly540 management over outstanding debts. The “Wings of Nigeria” has built a good reputation for its strong domestic network and well-appointed fleet, capitalizing on Nigeria’s rising middle class. But its public standing remains in question as furious passengers have complained about arbitrary flight postponements and cancellations and the unresponsiveness of its management. Nevertheless, Arik has emerged as West Africa’s biggest airline, with 25 aircraft flying to 27 destinations. Coupling its regional routes with international flights to London, New York and Dubai, it continues to enjoy double-digit annual growth.